A Japanese company is developing a vending machine that counts wrinkles and skin sags to check a smoker's age. It plans to use face recognition technology to prevent anyone under the legal age of 20 buying cigarettes. From July vending machine companies could be prosecuted if tobacco is sold to anyone under the legal limit. Purchasers who failed a digital camera "age test" would need to show the machine an ID card to establish they were legally allowed to smoke. The Fujitaka company system compares facial characteristics including bone structure, sags and crow's feet against a record of more than 100,000 people. Spokesman Hajime Yamamoto told Reuters: "With face recognition, so long as you've got some change and you are an adult, you can buy cigarettes like before. "The problem of minors borrowing identification cards to purchase cigarettes could be avoided as well." The company says the system gets it right in nine out of ten cases. The remaining 10% would be sent to a "grey zone for baby-faced adults" where they would be asked to insert their driving licence or identification card. Japan has 570,000 tobacco vending machines. The country's finance ministry has already given permission for an age-identifying smart card and a system to read the age from driving licences. But it has yet to approve the face-identification method owing to concerns about its accuracy. 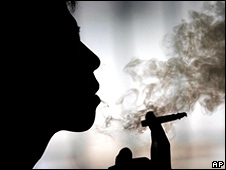 Underage smoking has been on the decline in Japan, but a 2004 survey showed 14% of boys and 4% of girls aged 17 and 18 smoke every day.